Summary: Community banks and their customers are feeling the effects of the government shutdown, now in its fourth week. We give you a rundown of the situation. Sadly, this is the 19th government shutdown since 1976. This is the longest one yet, so hopefully everyone gets their act together soon. In the meantime, community banks and their customers are feeling the effects, now in its fourth week. Many federal lending programs and other mortgage-related functions are delayed or cancelled, so we wanted to give you a rundown of the situation. The Department of Housing and Urban Development (HUD) is closed. The Federal Housing Authority (FHA) will endorse new single-family loans, but not reverse mortgages or property-improvement loans. Because the FHA is operating with fewer employees than usual, there are closing delays. Fannie Mae and Freddie Mac are operating as usual, processing conventional purchase mortgages and refinances. 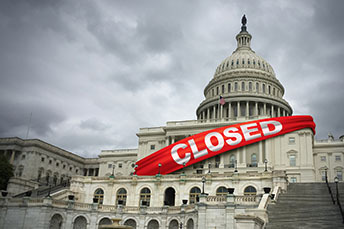 They have both given servicers and sellers guidance for issues that affect furloughed borrowers, including employment and earnings verification, flood insurance, Social Security number validation, and IRS record requests. Social Security Administration (SSA) offices are open and payments are being made. However, lenders who use SSA-89 to validate borrowers' Social Security numbers may run into trouble. The agency's contingency plan doesn't state whether processing SSA-89 requests is an essential function, and it's not clear whether the SSA is responding to these requests. The IRS, on the other hand, has resumed processing requests through its Income Verification Express Service (IVES) program, which banks use to verify borrowers' incomes. The IRS suspended the service when the federal shutdown began, but brought it back on January 7 and is working through its backlog. Because processing loans through the Department of Veterans Affairs (VA) is considered an essential function, these loans are being funded and closed. The Small Business Administration (SBA) is closed except for disaster relief operations, so these loans are at a standstill. That includes 7(a) loans for working capital and 504 loans for commercial properties. When the SBA is open for business, it typically manages around 200 loans for working capital and 120 loans for commercial property every day, for a total of approximately $200mm in daily credit. Borrowers may find it difficult to do business without that money, so community banks may need to have some additional discussions with business customers to see how they can assist. The Department of Agriculture is largely closed. It will not issue new loans or guarantees through its Rural Housing Financing program, and has cancelled closings for single-housing loans. Some soy farmer borrowers may also be under additional pressure, as they were promised $12B in government support in the wake of new tariffs yet checks are delayed. Also, farmers who must still get government approval of their crop totals in order to receive aid have nowhere to apply for that assistance at this time. Finally, the Environmental Protection Agency (EPA), Education, Commerce, Labor, Interior, Treasury, Health and Human Services, Defense and Transportation departments are also affected. We will keep you updated but thought you would like to know as you work to support your customers. The ABA Economic Advisory Committee (EAC) projects unemployment will dip to 3.5% by the end of 2019, which would be a 60Y low. They also project a 20% chance of a recession in 2019 and a 35% chance in 2020. Gen Z look for these top 3 elements in a job: competitive pay (72%); inspiring work (64%); and good benefits (62%). Digital lender Affirm, which specializes in small loans with short-term repayment plans, has announced a pilot test for its customers to deposit money into a savings account with a 2% annual rate via their app. The founder of Affirm was a co-founder of PayPal.